A Week Below Everest, Khumbu Region. A weeklong easy trek that takes you to the closest proximity to the Mt. Everest, world's highest peak which lies in the Khumbu region, through amazing Sherpa village and to many famous monasteries. The highest point on this trip is Pangboche at an elevation of 3908 meter. Throughout the trek you will have a magnificent views of Mt Everest [8848m], Lhotse [8501m], Nuptse [7879m], Ama Dablam [6856m], Thamserku [6608m] and Kantega [6685m], the great glaciers, snowfields and ice ridges. Each day's walk involves about six to seven hours hiking. Best time for dong this trip is Mar to May and September to December. A spectacular flight and hair raising landing on a steep mountain runway brings us to the start of our trek at the village of Lukla [2900m]. After meeting the crew, we head up the Dudh Kosi Valley on a well-marked trail to our first camp near the river at Phakding. NepalFrom Phakding, we cross and re-cross the river on high suspension bridges. Beyond Monjo is the entrance to the Sagarmatha National Park which was set-up in order to protect and preserve this fragile mountain environment. We then ascend quite steeply to Namche and along the way, if the weather is clear, catch a first glimpse of Mt Everest in the distance. Namche is the main trading village in the Khumbu and has a busy Saturday market - a meeting place for the Hindu traders from the lowlands and the Tibetan yak caravans that have crossed the glaciated Nangpa La. Camp is near the bazaar at Namche. Ascending from Namche Bazaar, we pass the airstrip at Syangboche and the Japanese-built Everest View Hotel. From the hotel, there are magnificent views up the valley towards Everest. 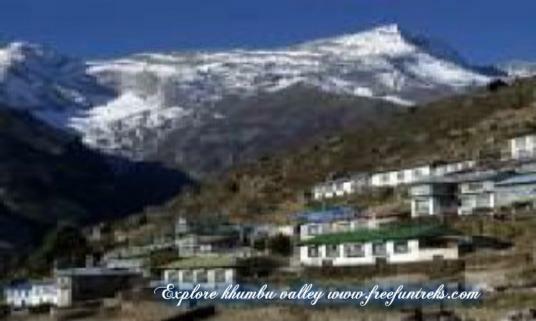 We walk to the picturesque village of Khumjung which has many beautiful houses and a gompa at the top end of town. At the nearby village of Khunde , is the famous hospital built by Sir Edmund Hillary, a vital part of health care in the region. TrekkingHeading east, we pass a large chorten and then descend to a bridge across the Dudh Kosi at Phunki Tenga. From the river the trail ascends through a forest of pine and rhododendrons, before arriving at Thyangboche Monastery. The views here are truly awesome, from the beautiful Ama Dablam to Lhotse and Everest at the head of the valley. The gompa itself has been rebuilt since a tragic fire in 1989 and is well worth a visit. A day excursion today to Pangboche Monastery and the nunnery at Deboche. The magnificent views of Ama Dablam are a highlight of today's walk and the monastery at Pangboche, founded in 1667, is the oldest in the Khumbu region.